Home » Blogs » TPS2015's blog » How an eCommerce development project can get derailed before it even begins? How an eCommerce development project can get derailed before it even begins? 5 reasons for spending more than 30% time in requirement gathering and planning. Planning your Ecommerce website? Want to move to the development phase ASAP? Don’t be overhasty, TransPacific suggests that you spend more time & resources in the planning and requirement gathering phase. Many software development companies make a mistake with insufficient planning and little requirement gathering. This creates chaos not only for the development agency but more significantly for the client who suffers as the quality of work deteriorates and delivery gets delayed. 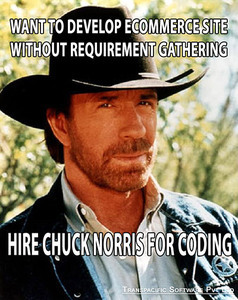 Such blunder of jumping into coding without planning is known as “Cowboy Coding”. Improved understanding of your own needs and requirements and planning effectively for them helps in reducing the time spent during the development phase of your Ecommerce Website. This in turn plays a significant role in decreasing the cost of the project as development phase is the one which can either drive the cost upwards or downwards. For instance, if you don’t plan well and there is not much clarity in terms of the requirements, you will keep coming back to the drawing board again and again during development resulting in “Scope Creep” which can completely derail your project. Furthermore, before creating the sign-off document, ask your eCommerce website development team to prepare a final scope statement containing details about what has to be included in the project also what is not included in the scope. During the planning phase you need to create Work Breakdown Structure . The whole project needs to be broken down into small tasks which should be divided amongst the team. Once WBS is in place, shift your focus on preparing the timeline with milestones for the tasks allotted to different teams. It is common with many development agencies to lose plenty of valuable time because of the absence of WBS and hard timelines. Don’t leave a stone unturned when it comes to the nitty-gritty of your eCommerce website. Clearly define stakeholders and define use cases Also, never hesitate in knowledge transfer between you and your development agency as the better they understand your project, the better the quality of the website.